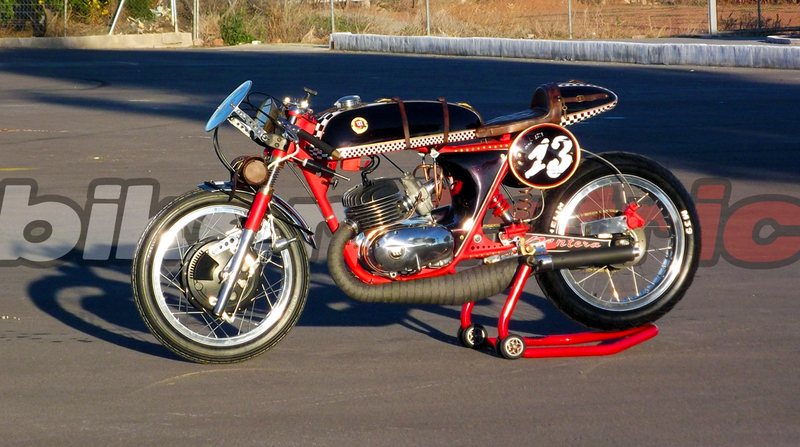 reader pedro jose sent his kickass montesa cafe racer. he calls it “pantera.” maybe that is because it was such hard pain in the ***. 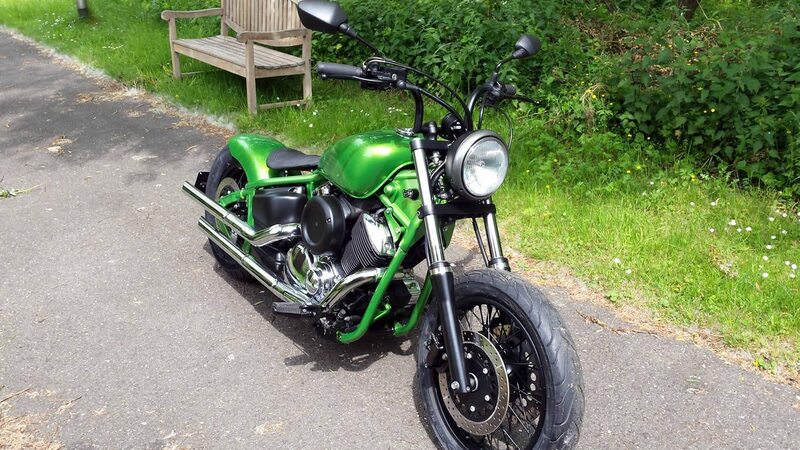 the final result is a unique take on the vintage cafe racer style. the story about the build starts three years ago when pedro was making decent scratch and decided to start a bike build. 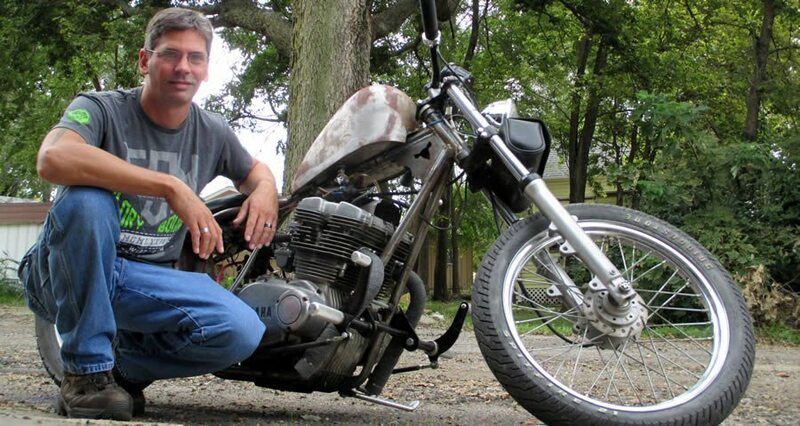 he did not have enough money to buy a new bike so he figured he’d work with “classic material,” which he thought would be a less expensive venture. 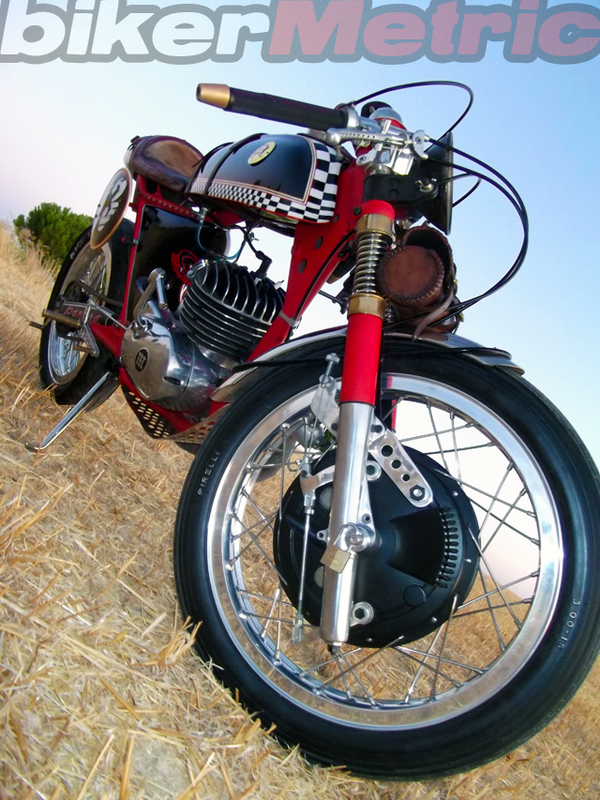 his first idea was to make changes in a derbi chassis and create a simple little drag-style bike with a bultaco mk2 250cc engine such as pictured below. 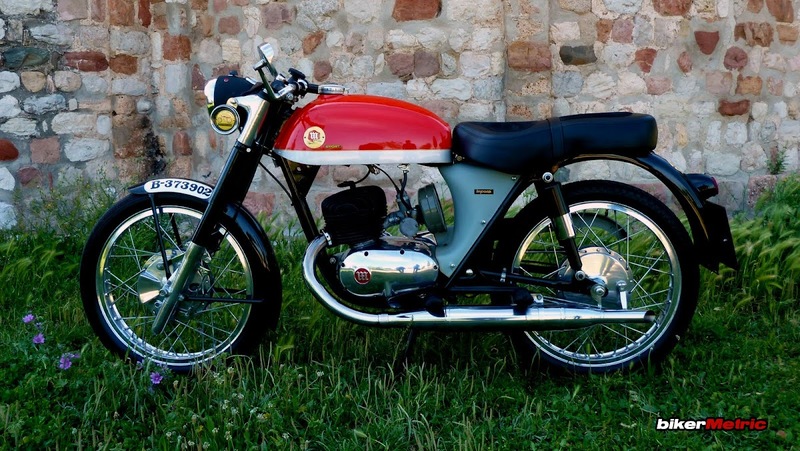 pedro spent a few months looking for the motor he wanted and could not find it until he was offered a 250cc montesa vappra mx from 1970. after some research on the machine, and liking the price, he decided to buy it. 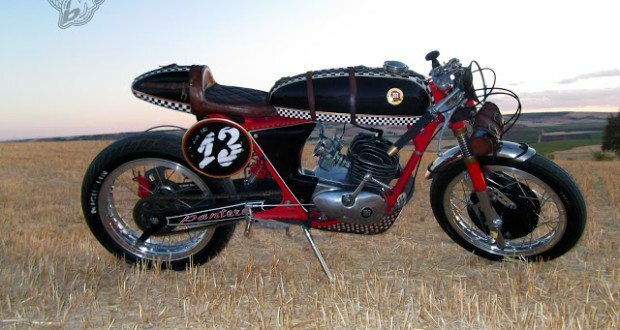 now he had the engine and chassis but decided he did not like his first idea, so he bought a montesa impala chassis and started thinking of mixing up a classic cafe racer look with some unusual adornments. pedro wanted something different and wanted it to reflect his personality. by the looks of it, he did just that. his career began in 1998 as a graffiti artist, chronicling his people and surroundings while waiting tables to afford an airbrush. 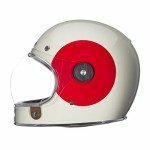 he began painting on anything he could including helmets and everything in between while learning mechanical techniques, fiberglass building, and metal fabrication as well. he worked to receive a bachelor of arts, and later went to granada to work as an artist, still painting anything he could, while waiting tables and sometimes getting paid to perform mechanical drafts. 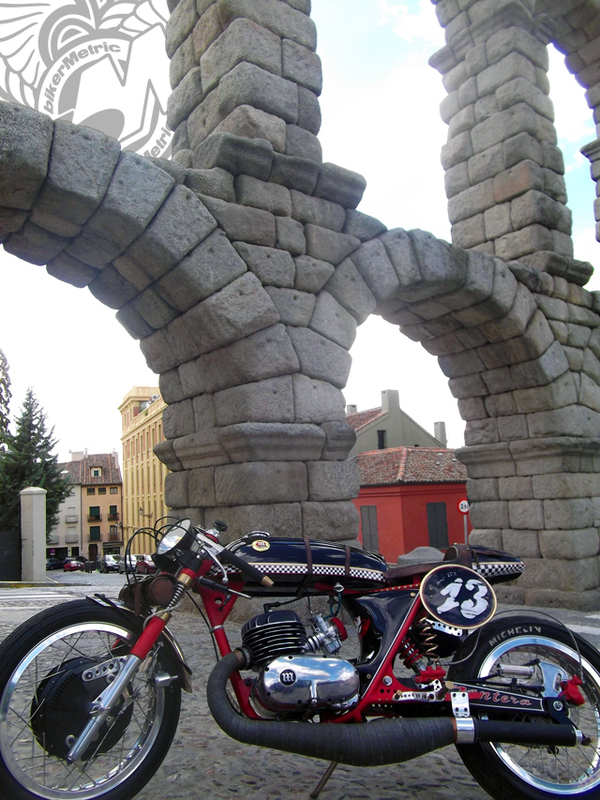 when he finally had a clear concept of bike he wanted, pedro started to modify the imapala frame. wanting to lift it a little and center the weight. he reinforced it to withstand the engine’s power while lightening the bike in general. 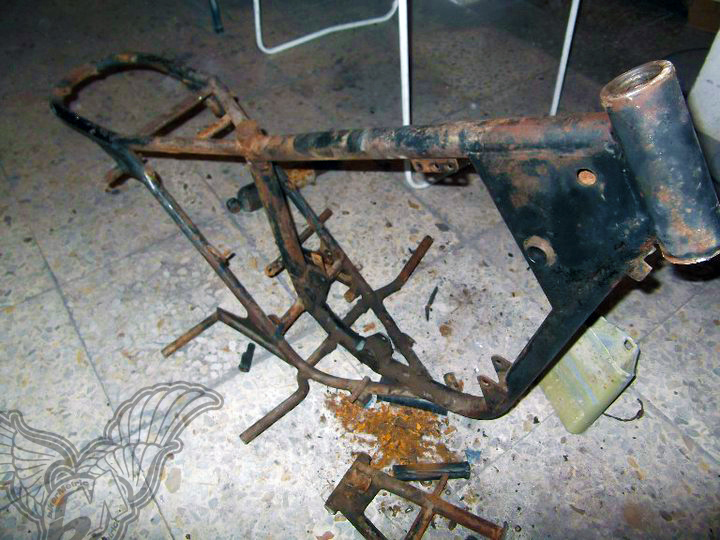 he made holes in a few areas of the chassis and filled them with shell casings. the rear of the bike was completely reconstructed and having no tube bender, he made a template on a table and heated the tube to gradually bend it. pedro then started working the impala forks, modifying and improving them with hydraulic interiors to enhance absorption while adding a steering damper. he polished the top of the stem painted the lowers in dull red to match the chassis. 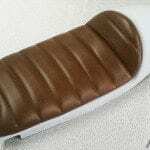 pedro then started to make molds in fiberglas for the gas tank and seat because it is lighter and less expensive than steel. 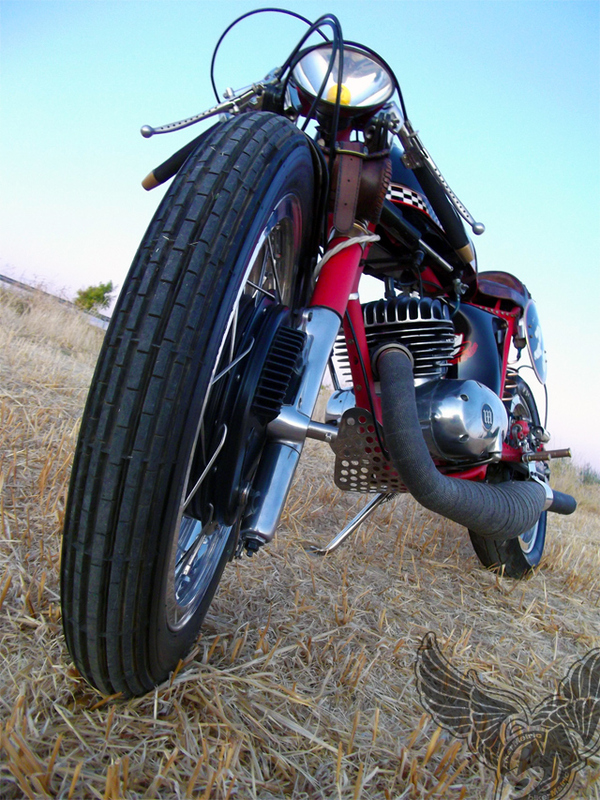 he thought, “for this type of motorcycle, the lighter the better.” he also fabbed the rear fender in fiberglass. then the engine had to be restored. when he opened the motor, he was surprised. third gear was shattered so he needed new gears. to do this, he bought a montesa 360 and adapted the gearbox to the motor. 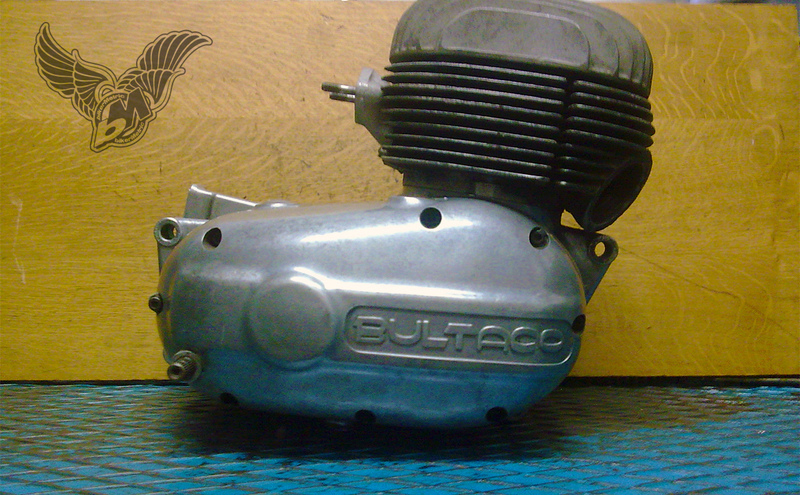 pedro made a new jacket in the cylinder, cleaned the original piston, machined the crank and closed the motor up. then, another surprise and “the last straw,” as he tells it. the piston was protruding 4mm above the shirt and he realized he had a 64mm crankshaft in the original 60mm space. he contacted the character he’d bought it from and found there were only two solutions; changing the crankshaft or the cylinder. then it sat in a corner. pedro was beaten down and moved on to other things. after a while he picked up where he left off and seeing a pirelli 3″-by-18″ in a garage, he had to have it; so he did. 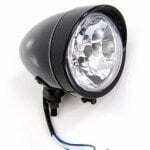 for the rear, he wanted a 120mm-by-18″, which was the maximum he could fit into a rocker-style impala cafe. when he went to purchase it, they were gone so he bought a 130×18. that meant he would need a new swingarm, which he “cut all over the place,” to mate it to the frame. as for brakes, pedro wanted a vintage front brake and started looking for four-cam drums, as they had better braking and were easier to obtain. the best in value was a grimeca brand, and besides being heavy, it still took a chunk out of his pocketbook. 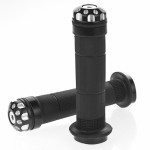 initially, he wanted black hubs, black spokes and polished rims. the spokes were polished instead. after some modification, the brakes were set up properly. pedro decided a disc would be fine on the rear. for parts he hand-made, each began with a drawing by hand on paper, then measured and re-measured. after getting his sketches right, he took the designs to his autocad program, and would fabricate the part. this bike was built with little more than a drill, a radio, a welding machine, and very basic tools. pedro used a 50-year old manual lathe to make all the bronze, brass, aluminum, iron and steel parts which include rearsets, numerous caps, hydraulic lines and much more. he hand-made the handlebars from aluminum and fought the with brake cables while still working on the chassis. pedro covered all the welds to look like one piece. then he added the “dull red paint.” he wanted the bike to look vintage with what would be thought of as an original paint job, not too shiny and sharp. his paint on the tank consists of traditional black and white squares with fillets in red, black, gold and white. after painting, all the parts were polished. after painting the parts, pedro needed someone to do the leather. after talking to a handful of people, he found one he liked. when he went to pick up the seat, straps, and bag, he did not like anything and called it “a disaster.” gotta respect a man who knows what he wants. he had to age them and buy other buckles for the belts. it was getting closer to what he wanted. he still needed to finish the crank, so he contacted a mentor, a mechanic from a racing department, and commissioned a new crankshaft for his engine. 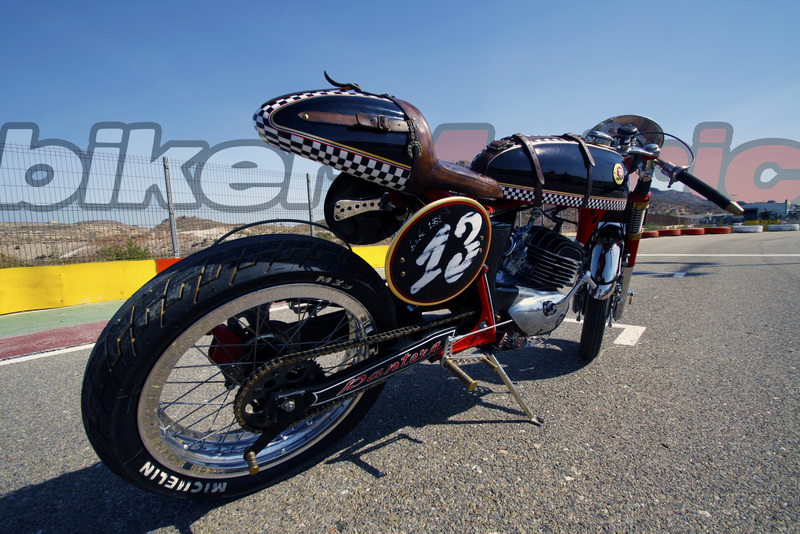 in the process, his mechanic hot-rodded the 250cc two-stroke single. the cylinder and head were “retouched.” a racing exhaust was added and carburetor work was done to take advantage of all his engine could offer. at the race track his bike was timed with a top speed of 121 miles per hour (195 kilometers per hour) while he was still fine-tuning her. he changed the chain and created a new sprocket for more speed. approximately 900 hours and as mentioned, three years went into this project. 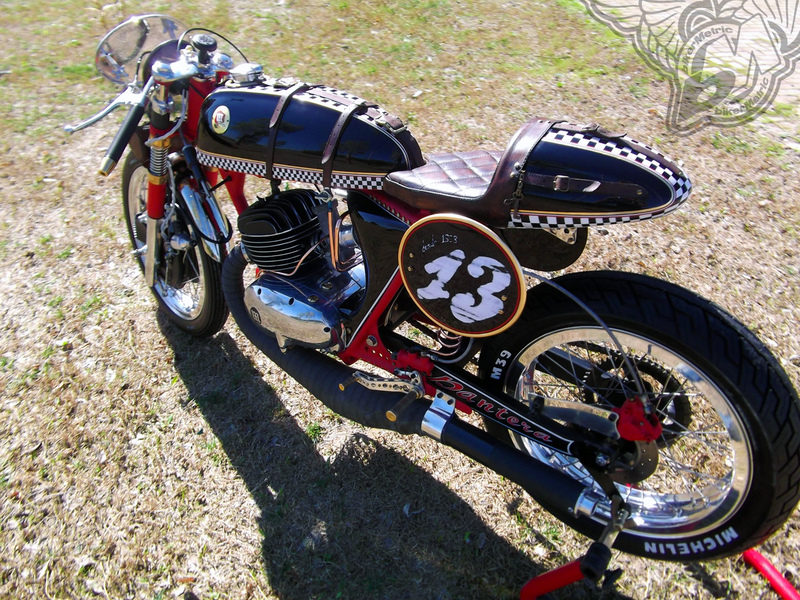 while doing this bike, pedro restored a few other classics as he tackled his pantera. he’d like to thank his dad for helping with cleaning and helping him fabricate the frame and swing arm, as well as his mother and brother for assisting in the final assembly. right on, pedro. 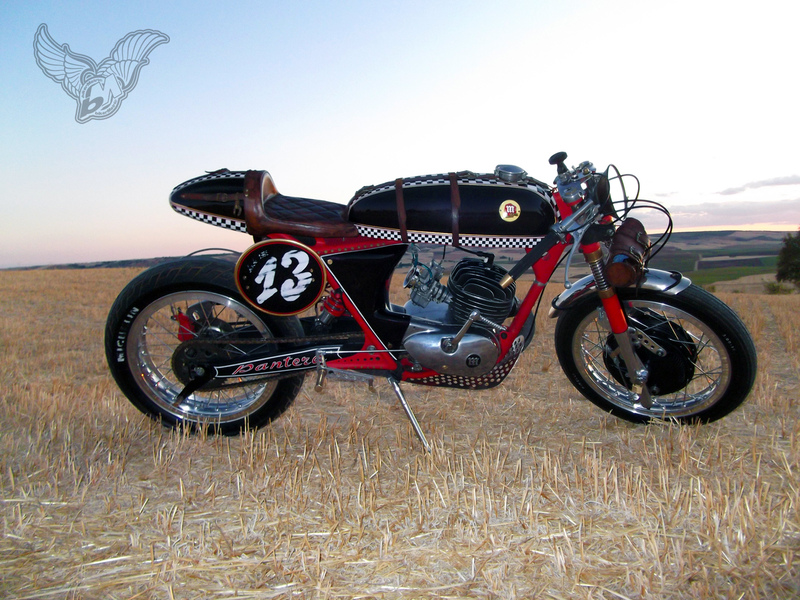 thank you for sharing your uniquely gorgeous and one-of-a-kind montesa cafe racer. 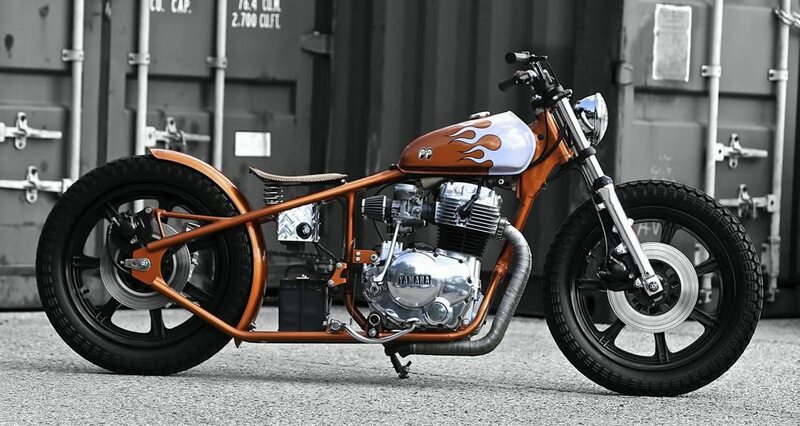 Finely a bike with the kickstand on the right side.Beautiful bike. I would really like to see build pictures of it. Especially the tank, and seat/cowl fabrication.